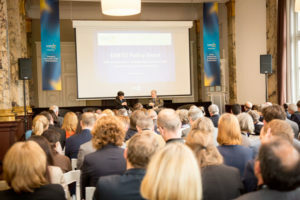 The second edition of the EARTO Policy Event was held on 14 October 2015, 15.00-17.30, at the BIP Info Place in Brussels. The event gathers representatives from RTOs, EU Institutions, industry as well as other key R&I stakeholders. The programme featured a keynote speech by Robert Madelin, Senior Innovation Adviser at the European Commission, and a high-level panel discussion with key Mr Madelin and representatives from RTOs and industry.